Beer 2: Black Cat Mild, paired with Mushroom Paté and spiced blackberry sauce. Beer 3: Smuttynose Pumpkin Ale, paired with Asian-Spiced Pork Tenderloin and spiced apples. Beer 4: Clipper City's Balto MärzHon, paired with Oyster Stew. Beer 5: Clipper City's Winter Storm Imperial ESB, paired with Savory Oxtails and preserved lemon polenta. Beer 6: Clipper City's Peg Leg Imperial Stout, paired with Fig Cake. 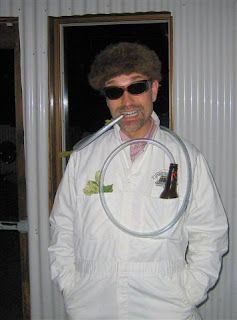 That's me, dressed as a crazy brewing scientist? Here's another, earlier, Sputnik beer dinner.